The city's fire chief told reporters that family members heard the hoverboard making "sizzling and cracking" sounds shortly before it burst into flames. The fire chief told ABC News that hoverboards are "notorious for starting fires." Hoverboards are self-balancing scooters that are powered by batteries. From the get-go, it seems these batteries have been a problem. 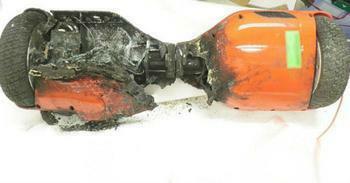 A year ago, the Consumer Product Safety Commission (CPSC) counted 52 reported fires allegedly linked to hoverboards. At the time, it issued a warning to consumers to make sure any product they purchased had been tested by Underwriters Laboratories (UL). The agency said all hoverboards lacking the UL seal were subject to recall. In a letter written 13 months ago to importers, retailers, and manufacturers, the CPSC said that unapproved scooters pose "an unreasonable risk of fire" because of problems with the lithium-ion batteries that power the self-balancing boards. At the time, it noted that at least two homes and one car had been destroyed by hoverboard fires. Several retailers, including Amazon and Target, stopped selling hoverboards last year over safety concerns. By late 2015, most major airlines banned hoverboards from being brought onto aircraft. If you own a hoverboard, UL recommends keeping it away from flammable materials while charging. It's also important not to over-charge the device. Follow the manufacturer's recommendation for charging time. Also, you should only use the charger that comes with the product. If a fire does occur, call first responders immediately. UL notes that most fire extinguishers are not suitable for use with battery chemical fires.